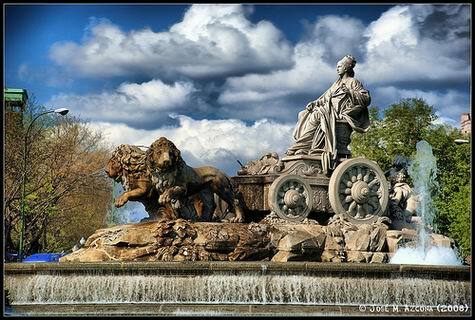 The monumental Cibeles Fountain has become a Madrid icon. Located in the heart of the city (see location on our sights map), it shows Cybele, the Greek goddess of fertility and nature holding a sceptre and a key while being pulled by two lions on a chariot. The pull of the wild lions symbolize the power of nature or of the goddess. Designed by Ventura Rodriguez and sculpted in 1782, it originally stood outside the Prado Museum facing the fountain of Neptune. 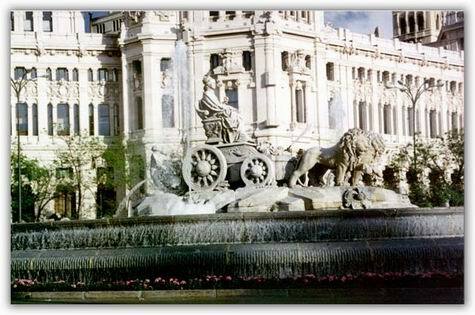 It is said that the source of this original fountain actually goes back to when Madrid was still a Moorish settlement. It provided water to the local population, but in the 19th century it was moved to the centre of the square where it is found today and adorned with other decorative details. The Spanish football (soccer) team Real Madrid has unofficially adopted the fountain. It is used as a meeting point for its fans and often for the players themselves whenever the team wins the Spanish league or Spanish Cup. La Plaza de Cibeles is disected by two major roads: running north is the Paseo del Prado, which turns into the Paseo de Recoletos after the square, and running from West to East is Calle Alcala. On each of the 4 corners of the square you may find an interesting building. The Palacio de Buenavista was constructed in 1777 and currently houses the Spanish Army's headquarters; the Palacio de Linares was constructed in 1877 and is owned by the Casa de América organisation, dependent on the Foreign Ministry and which promotes political, economical and cultural ties with Latin America. The south-west corner of the square is home to the Bank of Spain, housed in a large, dignified building whose construction work started in 1884. Lastly, one of Madrid's most beautiful buildings - the Palacio de Comunicaciones, finalised in 1917, and since 2007 the headquarters of the Madrid City Hall.